Westerly Library and Bank Square Books present an author talk and book signing with author Carl Johnson for the new volume in his popular series The Baseball Buff’s Bathroom Book. Each book in the series includes fifty short essays about major events and/or players in Major League Baseball history. The latest volume contains stories about Westerly native Dave Stenhouse, the first Rookie Pitcher ever to start an All Star Game, and Stenhouse will attend the event and speak with Johnson. The book also discusses the Philadelphia Phillies’ 1950 Championship team, dubbed the Whiz Kids and managed by Westerly’s own Eddie Sawyer. 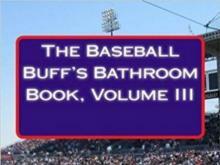 THE BASEBALL BUFF’S BATHROOM BOOK, VOLUME III, contains a series of fifty essays about major events and players in baseball, both historical and contemporary. The essays are from 1,500 – 2,500 words in length, designed to be read in short periods of down time, hence the title The Bathroom Books. The essays are historically accurate representations of people and events produced by Carl H. Johnson, a columnist with the Biddeford, Maine, Journal Tribune. This book also has articles about players such as Dizzy and Daffy Dean, Vinegar Bend Mizell, Leo Durocher, Herb Score, Greg Maddux and Thurman Munson and relives the Impossible Dream Year of the 1967 Red Sox and the National League’s 1962 Tie Breaker. In addition to the Baseball Buff’s Bathroom Book series, Carl Johnson has also authored two books about the Red Sox. His first, From Beer to Beards, which chronicled the Red Sox roller coaster ride from Worst to First from 2011-2013 was called ‘The best baseball book I ever read ‘ by the Sanford News reviewer and his second Red Sox book Big Papi and the Kids followed the Red Sox and designated hitter David Ortiz through the 2016 championship season and was called by one reviewer ‘Another Grand Slam for Johnson’. He covers Major League Baseball and the Red Sox for the daily newspaper The Biddeford Journal Tribune in Maine and also writes a weekly column entitled BASEBALL WORLD for that paper. He is a graduate of Stonington High School and graduated the University of New Haven with a Bachelor’s Degree in Criminal Justice Administration. He also attended and graduated from the Federal Bureau of Investigation’s National Academy. He grew up in and lived in Stonington for most of his life and served as Police Chief there from 1975 until his retirement in 1988. He went on to serve as Chief of Police in Concord, Massachusetts from 1988-1993. He moved to Maine in 2010 and now resides in Sanford, Maine.